While I'm not going to rehash all she says (I highly encourage you to check out her article), I completely understood her feeling of discovering herself all over again. Personally, I think I have always hidden, coped, and found comfort in food, and so as I try to soothe myself in other ways, I am realizing that when I'm not in a carb and sugar induced fog, I really don't know much about myself. This is both a very exciting and terrifying thought! I am really hard on myself a lot. Really hard on myself. Instead of looking at mistakes as wrong actions, I tend to look at myself and consider myself wrong overall. I also thinks this stems a lot from childhood, where I frantically tried to keep up a picture-perfect smile while hiding my true feelings very deep inside of me. In my family, alcoholism is somewhat common, and the more I go on this journey to understand my own "addiction" or "disease" or whatever (we can discuss terminology later), I see lots of similarities between my journey and the journey for an alcoholic to become sober. My question for you all is - if you are far along in your journey, what was one of the biggest life lessons you learned as you adapted to a healthier lifestyle? If you are closer to the beginning of your journey, what's one lesson you hope to learn? TGIF Everyone! and my heart lately is growing fonder and fonder of living a healthy lifestyle (that I have, unfortunately, been absent from the last couple of weeks). I have put my determination to get healthy on a shelf somewhere and promptly forgot about it (or was in denial of seeing it stare me in the face?). I shake my fist at myself and say, "WHY did you let such great habits once again slip through your fingers?" I sulk and scold myself all at the same time. Things outside of my blogging/healthy living researching/Sparkpeople participating life has been going by at a very high speed, and it's only now I am catching my breath and realizing that I am WAY off course. I haven't gained any weight back (not one pound - as odd as that is) but I am also not exercising or putting much effort into what I'm eating. These aren't excuses - I chose to make really bad choices about how to handle these situations, and that's WHY I am not in the shape I was a couple of weeks ago. And you know what? I miss it. Lately I've noticed a familiar feeling of being enslaved to food again - like I have to constantly satisfy my cravings or go crazy. I think it's the carbs talking, I really do. I was easily passing up many tempting choices, but now I can't seem to let them go by - telling myself all sorts of lies to make each step off the plan "not a big deal"
I also miss my daily strolls to clear my head, and yet I am looking for excuses not to exercise. I had been pushing myself and building my confidence. I came home sore almost every night, and woke up most mornings feeling well rested and ready to take on another day. Where has that enthusiasm gone? C'mon brain! Get it together! Tomorrow I pick up the pieces. Not as in tomorrow-so-I-can-stuff-my-face-tonight kind of tomorrows, but really there's not much left of the evening, and I don't have any dangerous food around, so I guess I'm starting tonight. Tomorrow, however, is when I make my routine a priority once again. I just have to keep going. Ok, so maybe I can't postpone FMM's. I love them too much! If you’ve taken part in FMM then you know the rules. If you’re new, please take a moment to answer this week’s question on your own blog then add your link in the comments section on Sarah's blog so we can all see your FMM questions and answers. The idea is to connect with other awesome bloggers so take a moment to post your own FMM post and comment on a couple of other posts. This happened a lot more when I was a kid. One I still remember vividly is having to swim across an ocean to get to an island filled with friends, family, and my favorite storybook characters at the time. I went here a lot in my dreams as a kid! Hmmm, I can't say that I've been TOO adventurous. The weirdest food I actually enjoy is probably pickled herring. It's the Swedish in me, what can I say? Eating in a restaurant is something I find extremely awkward, but I've gone to a movie a couple of times by myself. I can't say I enjoyed it as much as if I were with others, but sometimes there is just something you HAVE to see and no one is available (or wants) to see that particular movie. Pretty much everything, I guess. I got to spend time with some of my very best friends. There's nothing like hanging out with people who don't expect you to be anyone except exactly YOU. So refreshing! 8. If you were in the “Miss America” talent competition, what would your talent be? Singing. I'm a music teacher after all. Maybe that or speed-building small houses of cards? This really depends on who is calling, and how close the phone is to me. Most of the time, it's as soon as I can get to the phone. Ok everyone, it's time to play along! :) Have a FANTASTIC Monday! I am going to temporarily postpone the Friend Makin' Monday post that I love so much (and have been missing for the last couple of weeks) to discuss my recent encounter with an elliptical machine. Y'know how they say, "Pride comes before the fall,"? Well, today was my serious fall, at least a fall for my ego. I have been walking 2-2.5 miles on a regular basis and, quite honestly, feeling like I am on top of the world when doing it. I haven't been waking up in the morning with severe sore muscles, or cursing each step throughout my walks. It's been challenging but in a great and motivating way. "This time is going to be different though, right?" "This time, I am fitter, I am stronger, and so I am going to jump on that elliptical and act like I've done this a bazillion times!" Yeah, not so much. Still awkward, still exhausted. My leg muscles cried out, and I couldn't seem to keep my eyes off the clock. Darn you second hand! Tick...tick...tick. I willed and begged myself to stay on for five minutes, and I managed that, but BARELY. After this, I decided I should probably stick to walking for the rest of my workout, and realized that this itty bitty bit of elliptical exercise had caused me to start sweating profusely! Normally, when I walk, I work up a decent sweat, but MY GOSH! This is probably TMI, but I just want to keep honest about my experience. I ended up walking for only another 20 minutes and calling it quits. Definitely not my most successful workout, but it was a good reminder that I cannot get complacent with my exercise. It's great for my body to be pushed in different ways, and now I know that if I want to start my workout with a bang, I should start with the elliptical machine! Things haven't been super smooth or easy, it's been very much a roller coaster journey so far, and I don't know that I have it all figured out yet, but I'm getting there and progress is being made! 1. I now weigh less than I have in at least seven years - craziness! 2. I have developed a love for walking outdoors. This is absolutely NUTS, as I normally do not like exercise, and don't really care for the wilderness either. Last weekend I ended up legitimately hiking for over two-and-a-half miles (as measured by my wonderful MapMyWalk app - I'm in love with it) The picture of the bridge was almost at the end of my hike. I was super tired and a little sore, but man did it feel good! 3. Along with #2, I am just walking more. Walking a mile or two in a week used to be a huge deal, and now I am walking around 6-10! 4. I put on my first pair of jeans in I-don't-know-how-long. I forgot how much I love jeans! They weren't super comfy yet, but they zipped pretty easily, so YAY for that! 5. I love when people look at me, and are clearly trying to figure out what has changed. Very few have been brave enough to ask (I can't blame them) but it's so nice to just to have that spark of a recognition - I can't wait to see this increase as I continue to lose weight. 5. Even when I "overdo" it with food, and I do (perfection, I've decided, is just not in my plan, and it seems to be working for me so far), the damage is SO much less. My threshold for unhealthy food is so much lower, so a little goes a long way. So maybe I'm not done tooting my own horn yet. I think I'm OK with that, because at some point, I'm sure I will experience other lulls and need to reread this as a little extra motivation to stay the course. Just a side note - if you are celebrating Spring Break right now - congratulations. I just don't want to hear about it right now (one of the most stressful weeks for my work). I love break, warm sandy beaches, crazy cross-country trips, and relaxing at home - I'm just a bit bitter - don't mind me. Now on to something much better - FMM!! If you’ve taken part in FMM then you know the rules. If you’re new, please take a moment to answer this week’s question on your own blog then add your link in the comments section on Sarah's Blog so we can all see your FMM questions and answers. The idea is to connect with other awesome bloggers so take a moment to post your own FMM post and comment on a couple of other posts. So. Much. FUN! 1. Do you celebrate St Patrick’s Day? Mmm, not really. I wear green, and I have some of my students sing St. Patrick's day songs (or leprechaun, or rainbow, etc songs). But beyond that, not so much. Definitely Christmas for all around warm fuzzies with family and friends, beautiful music, festive atmosphere, etc. 3. Do you have a favorite ‘holiday’ food? Um, yes, all of the stuff I am trying to distance myself from - mashed potatoes/gravy, pie, appetizers in general. Good stuff. I really enjoy smaller-town parades where I know a lot of the people involved, and am able to watch with good friends or family, otherwise, I'm not so impressed. That's not to say that I wouldn't mind having a hotel room with a view of the Macy's Thanksgiving parade (would LOVE that) but I'll avoid the crowds if possible. Yes - when I was probably about 6 or so I was in the Twin Cities May Day parade (an awesome one!). I've also marched in a few more local ones throughout middle and high school. Sometimes. It really depends on what's going on. I don't host people very much, but if I did I think I would decorate more than I do. I'd love to, but Christmas-card-sending-season tends to be at the same time as crazy music concerts season, so currently as a music teacher, the answer is no. Someday, I hope to though! Ok, that's it! Be sure to participate if you have your own blog! I love reading all of your answers! Yes, last week was the week that took me down - in SO many ways! First, last week took me down to the lowest weight I have seen in at least 8 years - YAY! Good eating + walking 1.5-2 miles/day = one happy and healthy girl. I also saw my parents for the first time in three months, and they were pleasantly shocked to see my weight loss progress, so that was a huge source of boost in my motivation They were so supportive, willing to go on walks with me, and mindful about the things that I have chosen to eat (and not to eat). It was an excellent visit. Unfortunately, when I came back from that glorious weekend, real life hit me like a ton of bricks! I have two really big concerts placed a week a part, and all the stress really started to bog me down on Wednesday. I started the week off strong, exercise and food-wise, but used stress as an excuse to relax on that front, and am paying for it now! All of that stress manifested itself this weekend as a nasty sick bug of some sort, including fever, chills, aches, and really not wanting to do anything. The bad news? No exercising for this girl over the weekend. The good news? Being ill has allowed me to reset my eating habits and prepare for the week ahead. I'm not feeling 100% better yet, but I think there might be a short walk or exercise video in my future today - I've got to keep fighting for a healthier me! What a gorgeous day for FMM! 59 degrees and no school? Sounds like a perfect end to my weekend! If you've read my previous posts, you know that FMM is all about getting to know other bloggers! All you do is answer these questions on your blog, invite your blog readers to in, and then head on over to Sarah's blog at Losing Weight and Having Fun and post a link to your blog so we can get to know you better. 1. Where was the last place you went on vacation to? Well, I just got back from a mini-vacation to see my parents in the Twin Cities. It was amazing to just get away from everything and spend some quality time with them. 2. Do you have any plans for a vacation this year? Not right now, but hopefully if I continue to reach my weight loss goals, I will be able to cross some things off of my bucket list! 3. If money was no option, where would you dream vacation be? Probably a trip around the world in American Race style - go to a country, do something really out-of-the-ordinary-push-you-outside-your-comfort-zone tasks then move on to the next place. 4. What is your favorite vacation spot that you have visited? Definitely the US Virgin Islands (St. John especially). So much snorkeling, so little time. 5. Have you ever had a staycation? Kind of - I do enjoy spending my vacation time just relaxing, but I don't know about doing sightseeing in my own backyard or anything. 6. Are you a lie on the beach person or a go out and explore person? Currently a lie on the beach and go snorkeling person, but I believe that this might change quite a bit when I lose some more weight and am able to more comfortably move around. I will always love snorkeling though! 7. When you fly do you have a favorite airline? Nope, but I didn't mind American Airlines when I used them. 8. Have you ever had a ‘vacation from hell’ ? Probably my only one would be the time I got VERY sick on the 18 hour bus ride back from a vacation. It was absolute torture. Besides that, nope! 9. Have you ever had an airline lose your luggage? 10. Do you send postcards to friends and family when you go on vacation? Sometimes! It really depends on where I am or who I am with. I have so much to talk about today, and simply can't wait another day to blog about all three of these topics, so I'm just going to consider this a "weekly recap" - a mixed bag of all of the things on my mind this week. First, let's talk about this week's plateau. Weight-wise, I have been bouncing around the same 2-3 pounds this week, and I'm pretty frustrated about it. I have been putting in the work, exercise wise, but as the week progressed, my mind took a negative turn and I found myself going back to some of my old eating habits. After reading other people's weight loss success stories, there always seems to be a point where the blogger is doing everything right, and the scale is not moving - the dreaded PLATEAU! Let me be clear - this is NOT what I'm going through right now. I know exactly why my scale did not move this week, and now that I have acknowledged it, I can move on and get my diet back under control. I absolutely HATE that I'm counteracting all of this great exercise with awful eating habits, and that is going to stop immediately. This will be one of those goals were I will practice not being a perfectionist, and instead listen to my body. My goal each day is to reach 100 of each, along with continuing to walk 5-6 times/week. Some days I will hit this goal, some days I won't, but each day that I participate will be a day I will be getting stronger. This is nothing like my healthy eating goal. For this month, I want to stay away from refined carbs and sugar. Unlike the 100 challenge, this diet change is 100% possible, and I expect to reach this goal every day this next month, and will be more disappointed if I miss a day. First of all, I want to say how GIDDY I am that Friend Makin' Monday is back! Kenlie from All the Weigh has decided to take a break from FMM and hand over the reins to Sarah at Losing Weight and Having Fun for a bit. Kenlie has done an excellent job, and I fully understand her need for a break for now - so I'm really glad that Sarah has picked this up so we can continue to get to know others in the big blogosphere! Minnesota native, current Iowan, music teacher, learning to love myself. 2. 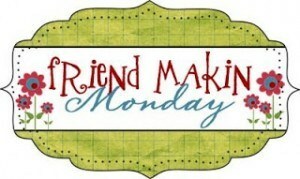 How did you find Friend Makin' Mondays? I can't remember which of the many blogs I follow linked me up to Kenlie's blog, but I've been hooked ever since! Nope, but I would love to in the future! More of a snack of some ham and string cheese. Depends on what you mean by "lived". I've "resided" many places for 2-3 months or more, but as far as "homes", I would have to say about 6 - mostly in Minnesota and Iowa, but some other places as well. Nope! I grew up with pets, and am anxious for the day when I find a place that will allow pets. I'm especially interested in getting a dog! No, but it is one of my "rewards" when I get close to my goal weight. OK - you know what to do! If you are a blogger, answer these questions on your blog, and then head on over to Losing Weight and Having Fun and leave a comment so others can get to know you. What a week it has been! Talking to a friend of mine, I explained that it has been the fastest and slowest week I've had in a while! In some respects, I felt like I was speeding through an emotional and physical obstacle course, with lots of extra events and changes to my daily routine. I am also in the midst of concert planning, and if you ask any music teacher, that becomes a CRAZY time of year! On the other hand, it seemed like a really slow week, in that I couldn't wait for the weekend to arrive! We've had some really crazy weather this week, including a very thick layer of ice, 3-4 inches of snow, and a huge thunderstorm with several inches of rain, so that has made the rest of the week pretty crazy. ANYWAY...so today I stumbled upon a new blog (have I mentioned that I LOVE reading other weight loss blogs, especially if they are people who have lots a lot of weight - so inspirational!). Clearly this is a blog I should have been following for a long time, but it is Tanee's blog at http://fromfattofitchick.blogspot.com/ She has lost over 200 pounds, is a mom and a runner! I absolutely love her posts! you can find her blog post about it here. And I thought, "I CAN DO THAT!" Ok, probably with a lot of modifications, but I can do it! I have been looking for something to add to my walking routine, especially something to get me up and moving in the morning before I head to school, so this should be perfect! I love that I can break it apart into as many pieces as I need to (which I am sure I will!) 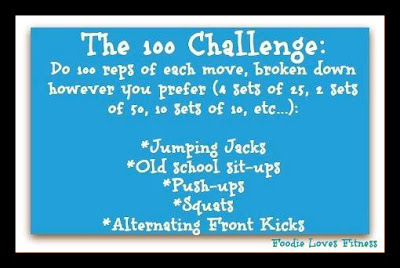 To modify, I plan on using modified jumping jacks (no need to put all of that pressure on my knees right now - I need them for walking! ), wall push-ups, and I will also be cutting out the sit-ups, as I tend to get the absolute worst thigh cramps when I attempt these (I'm not sure what is up with this - a good question for my doc the next time I see him). Tanee suggests that if you need a rest day, take it, so I'm just going to start and see how it goes. Has anyone else tried a challenge like this before? Did you finish it? Like it? I haven't blogged all week, but today has been a particularly inspiring day, so hopefully I'll have lots to talk about this week! I teach music to elementary students, and one of the biggest challenges I face on a daily basis is convincing hesitant singers that they CAN sing. Many people seem to believe that people are either born to sing or not born to sing, and while I do know and understand that people have different singing voices, I am also a believer that 99% of the population can sing. The thing is, singing is much more of a SKILL than a TALENT. Don't get me wrong, there can definitely be talent and "innate gifts" involved, but ultimately singing is something you have to practice to get better at. "Kinda like tying your shoes," I often tell my students (many of whom have mastered shoe tying in the not-so-distant past). I tell this to adults too, but they rarely listen ;). Today I read an article by Alan Henry at www.lifehacker.com here. He has so many incredibly good points, but the one quote that really jumped out at me was that, "a healthy lifestyle is a skill you work and get better at—not a thing you just get up and start doing one day." BINGO! Now he's speaking my language! How could I be so silly to constantly tell my students that singing is a skill, but not think about losing weight and adopting a healthy lifestyle the same way? I think that is why I am feeling so much more successful in the past month or so. I am taking things slower, practicing my exercise/healthy eating skills, and getting stronger all of the time! That doesn't mean I'm not making mistakes, I'm just learning from them. In the beginning of January, I began in the hallways after school to get some exercise. I started with completing 4-5 laps, then increased to 7 (1 mile) two to three times a week. It was slightly painful, but it was an exercise that I was able to do on a regular basis without feeling crippled the next day. Ever so slowly, I have moved up to 10-14 laps, four times a week. It's not an extremely fast improvement, but I'm increasing the mileage and the time I'm exercising because I am getting stronger and I am improving my skills. Today I did a "Walk Away the Pounds" DVD that I have had for AGES, but for the first time I was able to do the 4 mile walk, something I have never attempted before. It's not because I have more willpower, or because I've found some extra boost of energy, it's just because I am getting better at it. Talk about a non-scale victory! What non-scale victories have you been seeing in your own journey lately? Do you feel like these victories are proof that your "practice" is paying off? This week I decided to join a four-week Dietbet on Alex Respess' team (from Extreme Makeover: Weight Loss Edition). Dietbet is a website where people pledge money to lose 4% of their body weight in 4 weeks. Those that meet this challenge split the final pledge money. I have thought about doing one of these many times, but I finally think I am in the right head space to be successful. I picked Alex's team for several of reasons: 1. I got to talk to Alex when auditioning for EMWLE a while back, and he was a really sincere guy. 2. I think he and Courtney Crozier make a very cute couple, and she has been a huge inspiration for me, as she and I share a lot of similar attributes. 3. It's a Dietbet with many people, so there will be lots of support and opportunities to get to know other people. There is another Dietbet that I am looking into joining that is a 6 month challenge. While I like the idea, I am not sure that I want to invest in that financially right now. In other news, I am excited to share that I now consider working out to be a good habit! I have heard other people talk about how, eventually, exercising just becomes part of your routine. I never thought I'd be one of those people, but I noticed this week that exercise was no longer a negotiable thing. On Friday I taught all day with a really nasty soar throat and a little bit of a fever (I know, I know, I shouldn't have gone into work, but if you are a teacher, you know that sometimes it's just easier to go in than it is to write sub plans! 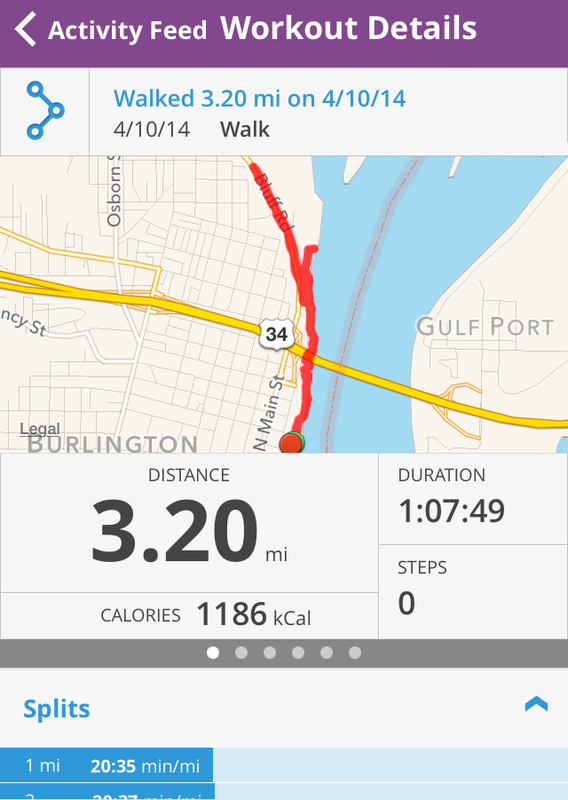 ), and I still managed to walk 1.5 miles after school. Success! I love reading other people's weight loss/fitness/health/randomness blogs, and this week I am inspired by Emmie at www.authenticallyemmie.com to make a "Transparent Tuesday" post. The idea is to share some not-so-idyllic moments of your journey, and to capture the realness, imperfections, and bumps in the road. So here I go! This weekend, I let an office Superbowl celebration derail me. After making a plan and bringing food that I could eat, I still couldn't resist some items. After that, I let "old Jen" take over, and somehow convinced myself that this slip-up was reason enough to throw away the entire weekend. Off-plan eating, not exercising, and overall being lazy. And you know what? I felt miserable the WHOLE TIME! I felt literally sick, and realized that my body loves (and was starting to get used to) me giving it exactly what it needs - balanced nutrition and exercise. The good news is that I am officially back on track. I have exercised for three days in a row, my eating is back under control, and I'm feeling good! The biggest part of my journey, I can already tell, is going to be how I respond to setbacks. I will thank last weekend for reminding me of why I am doing what I am doing, and I will move on. By the way, the blogs to the left are some of my blogging all-stars, the blogs I read when I need encouragement, support, or a swift kick in the rear, and I highly suggest you check them out! As someone who has and continues to struggle with very demeaning and damaging self-talk since I can remember, this is very new to me! Now that I am well into a streak of exercising nearly every day, I am discovering a small but stubborn voice emerging in my head while I exercise. No, I'm not struggling with multiple personality disorder :) Call it happy endorphins or whatever, when I am exercise I am starting to tell myself messages such as, "YOU ARE STRONG", "YOU'VE GOT THIS", "NOTHING CAN STOP YOU NOW!". It's absolutely fantastic! The best part about it, is that it is not forced. When I'm exercising, I no longer have to try to convince myself that I can do this- I actually believe I can. This doesn't mean it's been easy, nor does it mean that I'm doing anything extraordinary. But for some reason, this time I must be providing my body with what it needs to feel just a little healthier every day, and my body is responding with happy messages flying through my brain. Let this weight-loss, health-gain, self discovery process continue! 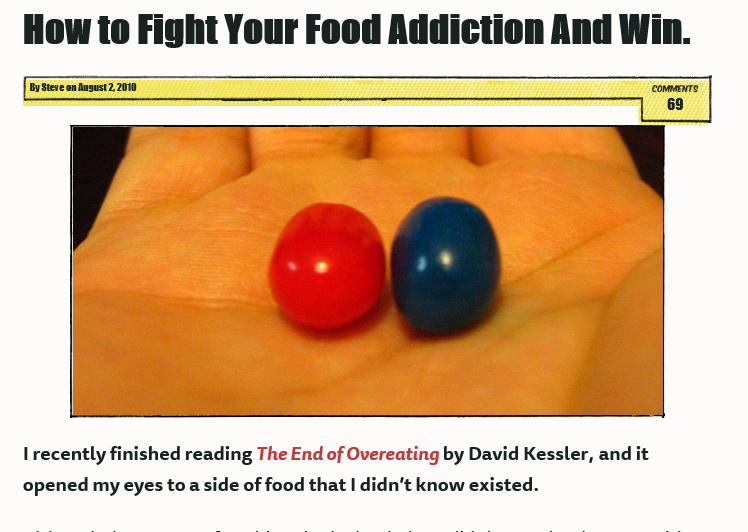 My addiction with my scale is something I really want to tackle, starting this week, and so I am making a promise to all of Blogosphere that I will not step on it again until Saturday morning. See, I LOVE stepping on my scale way too much. Like, sometimes 4 to 5 times a day. This may not be a problem, except my mood and enthusiasm is tied directly to that number. As we all know, weight can fluctuate day by day (and even hour by hour), so I know it is not healthy for me to be putting so much emphasis on what it says. I also know that the last time I fell off the low-carb wagon, it was because the scale gave me a number I didn't like (after a day or two), and I allowed doubt to creep into my head and ultimately convinced myself that I may as well take a "cheat day" since the scale isn't moving - cue 3 months of being off plan!! So, I'm thinking that weighing myself once a week is enough to make sure I am heading in the right direction without becoming obsessive over the number. I'm still frightened over what I might do on weeks where I hit a plateau, but I'll cross that road when I get to it. For now, I'm moving in the right direction, and that's all that matters! Let me start by saying, I don't necessarily agree with how the show The Biggest Loser gets their results. I fully understand that reality TV is NOT reality, and that there are a lot of "smoke and mirrors", editing, etc. That being said, makeover week is always my FAVORITE episode of the Biggest Loser, and last night's episode was no different. As a woman larger than most of their "before" images, I desperately love to see people reach their goals, and dream that someday I might be a success story too. It's the same reason I scour Sparkpeople and other websites for success stories. It's so empowering, motivating, and reassuring that people have come from where I am and persevered. It's also amazing to watch the contestants' families show so much emotion as they are reunited with their relatives. Unlike some of the previous years, I really thought everyone's makeovers were really stunning. I wasn't a huge fan of Alison Sweeney's outfit or Marie's hair, but all in all they looked amazing. After the makeovers, there was a big shock that two contestants were going to be eliminated. I'm not for spoilers, so I won't say who they were right now (you know how to Google it! ), but I know that makeover week was a lot of their "milestone" episodes, so to have just gotten that far was a huge accomplishment, and many contestants recognized that significance as well. This makes sense, because the makeover gives them a whole new outlook on who they can be from that moment on. As for me, this episode made me realize that my bucket list has very little to do with improving my appearance via clothing, makeup, etc. There are a couple (wearing "regular" sized clothing, etc.) but not that much. I think a lot of this has to do with the fact that I have never really known the feeling of going to a store and having my pick of clothing. Therefore, I haven't really paid much attention to fashion, makeup (except the basics), and hairstyles. I'm pretty sure I hve no idea what I'm missing. So, the first thing I am going to do when I get close to my goal weight is to get a crash-course on these things from my friends. I just...don't...understand - YET! Ultimately, I know it's not all about the outward appearance. It's not even the biggest part. It is, however, something to look forward to! 1. What time did you go to bed last night? About 11pm - much later than this teacher should be, but today is a professional development day, so I didn't have to go into school very early. 2. What is the last thing that made you smile? Waking up this morning to some sore muscles - they let me know that I really pushed myself yesterday! 3. What is the last movie you watched? Bridesmaids - it was on TV last night, so while I was finishing report cards I was watching. I had never seen it before - typical chick flick (not my favorite kind of movie) but some pretty good humor and one-liners to keep me entertained. 4. What did you have for breakfast today? A light blueberry yogurt and a couple of clementines. 5. Would you rather mop all of your floors or do laundry? DO LAUNDRY! This is the first time in my adult life that I have a washer and dryer in my apartment, and so it feels really easy! Then again, I don't have many floors to mop, so that wouldn't bee TOO bad either, but I definitely would prefer laundry. 6. Do you drink coffee? Very occasionally, and it's only the "fru-fru" drinks that are more sugar and milk than actual coffee. The smell, though, is the best! It brings back lots of childhood memories, as my parents are big coffee drinkers. 7. Will you watch the Superbowl? Yes, though I won't be glued to the screen or anything. I like to be able to talk about the commercials (and sometimes the game, if it's a good one) with my students the next day. 8. How often do you shop for groceries? About once a week or so. 9. What kind of workout will you do today? It depends on how nice it is outside after school, but I'll probably just walk laps inside the school building. 10. Do you use a fitness tracker? I want to really bad, but it's one of my "weight loss rewards", so I'll hae to be patient. If anyone has any that they prefer, please make sure to let me know! I'm thinking about going the Polar Heart Monitor route, but I'm not sure. I am currently on a 3-day streak of walking 1 mile per day. It's not much, but it IS consistent, which is something I'm apparently getting better at! Most revealing in these last three days, however, has been that now that I have a streak going, it's easier to KEEP going. The hardest was the first day, by far! I know that there will be other very challenging days, but I don't know how many will be harder than that. I've also noticed that once I start moving, I'm more likely to KEEP moving after the workout is done. This means I'm being more productive at work, getting more things around the house, and just making some smarter, healthier, and productive choices in my life. I've read other bloggers talk about how getting control of their eating really spilled over into their whole lives, and I can see just a little speck of how that might happen. Very exciting! Finally, I forgot how much moving just makes me FEEL better. I don't really like exercising itself, but my mood is just a little bit more positive and stable with a workout under my belt. On a side note, tomorrow is a full moon, and if you are a teacher you know that this means CrAzY kids (no, really! I didn't believe it when I first started teaching, but you really can tell!). Good thing it's also hump day! Friend Makin' Monday time! Just a reminder- if you blog and want to participate, answer the following questions on your own blog, and then post a comment at www.alltheweigh.com so we can get to know one another! A big shout out to Kenli for putting this together! 2. Do you believe in GOD? Absolutely. 3. How has your readership changed since you first started blogging? Well, I really still consider myself a newbie to the blogging world, and unfortunately, I think I lost the few readers I had when I stopped blogging and ultimately relaunched this blog. I completely understand, however, and am blogging more for my own benefit than anything else. 4. If you could choose between a serious relationship or $100,00, which would you choose? Not a tough question. If we are talking about a mutually loving, respectful, and adventurous relationship, I would say absolutely that, but otherwise I would take the money. The last thing I need right now is additional drama in my life! 5. Have you ever changed political parties? I have voted for both republican and democratic candidates, but consider the candidate more than the party on most occasions. 6. If you were put in a position in which you had to be in a room with someone you can't stand, how would you handle the situation? This really depends on the circumstance. Are there other people involved? I have some awesome friends that would absolutely come to my rescue and divert the person away from talking to me if they could. If I was alone, I would probably try to play cards or something to give us something to focus on besides each other. 7. Do you ever eat in secret because you don't want anyone to see what you consume? Yes. Shame and not wanting to admit the reality of my situation is really at the root of why I am so overweight in the first place. 8. Do you use curse words in your daily conversations? Surprisingly not, and honestly it's not really much of a choice - it's just never been something I've done. It is fun to bring out curse words when among good friends occasionally, just to absolutely shock them! 9. How much do you tip when you've had decent service at a restaurant? Normally twenty percent, rounded up to the next highest dollar. 10. How do you responds when someone confronts you? Honestly, I hate confrontation, so sometimes I will say whatever I need to say to get it done with (I'm not proud of it, but since this is all about truth). I wish I could stand up for myself, and be comfortable enough in my own skin to speak up if I feel the confrontation is uncalled for, but right now I'm not there. I'm working on it though! Today I am 100% fed up. Most of the time, I consider myself to be an extremely positive person - sometimes to a fault. I think in some ways it has actually been a coping strategy I've used since I was young, trying to forget the bad things going on in life with a bag of Cheetos and a smile on my face. I don't like to feel defeated (or at least admit it), and I REALLY don't like other knowing that I don't have this world all figured out. It's denial, I know, because with one look at me, any stranger would know that there HAS to be issues under the surface. But yet, I remain the sunny-faced happy friend that others can rely on in their darkest hour, but can't bear to reach out in my own. So here it is. This is all of the stuff that I bottle up and stuff down with food - and of course THAT isn't working for me! 1. Feeling judged. All. The.Time. This is more to do with my own insecurities than anyone else. I've never been able to pull of that "big girl with all the confidence in the world" look. In someways, though, I KNOW that people make snap judgments on appearances - I do this too- and I would just like to have a chance to win people over without having to overcome the first impression. 3. Giving up - very similar to #2. In my life, there have been things (both weight-related and not) that I have wanted to achieve, but I don't have the perseverance. As a child, I very rarely had to deal with delayed gratification (for reasons I'll go into later) and now I feel like it is a skill that has left me somewhat disabled. 4. Aches, pains, and frustration with my body. I am in my mid 20s. I should be able to go FOREVER without my legs hurting, without getting out of breath or needing to sit down. I should be able to sit in even the rickety-est chairs with full confidence that it is strong enough to hold me. I know I will enjoy moving SO MUCH MORE if I lose even a percentage of all the weight I need to lose. 5. Low self esteem - I want to go out and pound down some serious goals so that I can stop doubting myself at every turn. I doubt every decision, every action, and even every opinion I have, and I know that if I can go out and achieve some of my goals, I will feel so much more ready to take on anything. Some of this I have mentioned in another blog post, but tonight is a night I just need to say all of this again, maybe to give myself that swift kick in the rear. Now on to the weekend! 1. What has been your happiest moment in 2014 so far? So many great memories already! Reconnecting with my two very best friends over lunch and a movie - spending time with my family in Minneapolis - a snow (cold) day and a half of extra vacation before the second half of the school year. 2. Share the last compliment you received. I posted a pic on Facebook that had some really sweet comments on it. 3. What is one thing that you plan to accomplish in the next week? I want to make sure to pack healthy lunches for work each day this week. 5. If you could go anywhere in the world free for the next two weeks, where would you go? No question - a villa in the Virgin Islands. It's really my happy place! 6. Describe a significant event in your life that caused you to change your value system. Movingg away from my support system and community for a new job. It really reminded me of how IMPORTANT and BLESSED I am to have so many amazing people in my life, and how much support they give me! 7. What made you decide to live where you currently live? I really moved only for a job opportunity. It is farther away from my family and friends, but sometimes you have to do what you have to do! 8. What is the first thing that comes to mind when you thing about GOD? How much I need to reconnect and find a church home. 9. If you could have a long conversation with someone famous (and alive now) who would you choose? Jennifer Knapp- she has been my music idol forever, and her insight always makes me think a lot. 10. List three things that you are thankful for today. - Words of encouragement that surround me and tell me that I CAN DO IT! Don't forget to do this on your own blog and comment on Kenlie's website!